How did LIGO detect them? Sheila - It's a big challenge and that's one of the reasons it's taken decades of work to do this, and there are various things that are key. 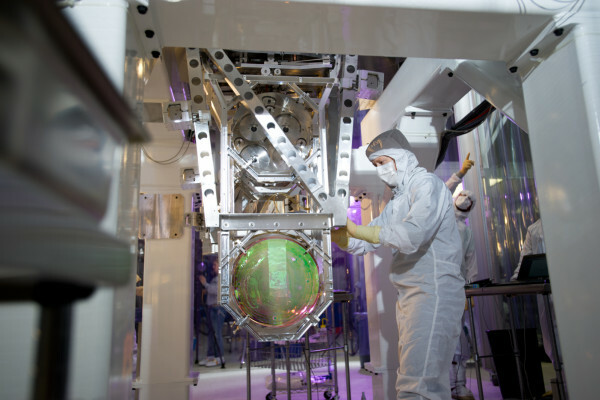 One incredibly important thing, of course, is to take those mirrors that the gravitational wave's going to shake and make sure that nothing else shakes them. So, we couldn't just sit them on the ground because the ground moves all the time. There's what we call seismic motion - the ground shakes. It shakes due to far away earthquakes; it shakes just due to people driving cars past, so we can't do that. Instead what we do is we take the mirrors and we actually hand them and we suspend them, in fact, on very fine ultrapure glass fibres. And why do we do that? Well hanging the mirrors actually isolates them from the ground. If you hang something you build a mechanical filter; it filters out noise, the ground noise. But, those glass fibres are special because every single atom in those mirrors, and in the fibres that hand it, it's shaking slightly. It's just at room temperature - everything that has is just at room temperature is shaking a little bit. That's what we call thermal energy and making these fibres out of glass and these mirrors out of glass - and to give you some perspective those mirrors are 40 kilos, they're not small - both isolates, filters out the ground motion and keeps that thermal motion low. So what we've done is make mirrors that are almost motionless; they're hanging there just waiting for a gravitational wave to come by and shake them. Graihagh - Wow! So we've detected one of these gravitational waves. It took what 20 milliseconds? Is that how long shook the mirror for, yes? We've detected one of them - when's the next one? Sheila - That's a good question and we don't know the answer to that yet. We do have more data that we've taken. The event we detected here came from some fraction of the data that we've got so far and that's all we've had time to analyse. We do have more data, we just haven't had time to look in there yet and see what's in there. So we can check that and announce that and if there's anything there or see it. So, we don't know. You'll have to wait to hear back from us but we're looking hard. Previous But didn't BICEP detect them before? Next What have the LIGO team detected? Why is ice on my car harder to scrape off?